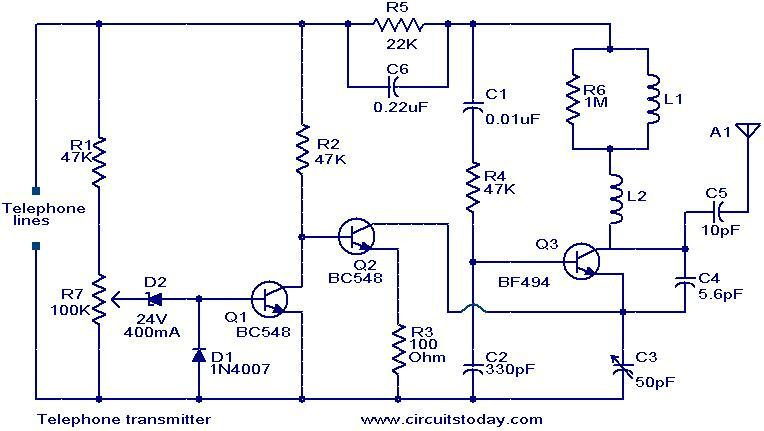 This is a simple, but very useful circuit that can be used to transmit telephone conversations. When the telephone receiver is on hook the voltage across the lines will be about 48 volts. The preset R7 is so adjusted to obtain a 24.7 V across between the cathode of D2 and ground. At this voltage the Zener diode D2 will be in breakdown and the transistor T1 will conduct. This makes the transistor T2 OFF. When the receiver is off hook, the line voltage drops to about 11 volts. This makes the transistor T1 OFF and subsequently the T2 ON. The T2 in switched ON condition will provide a DC path for the transistor T3 used in the FM transmitter section. The transistor T3 is wired as a common emitter radio frequency oscillator. In simple words the transistor T2 serves as an ON/OFF switch for this oscillator. The modulated signal will be available at the collector of transistor T3 and the signal id fed to the antenna via capacitor C5. For L1 make 45 turns of 36 SWG enameled copper wire on the resistor R6 itself. The resistor R6 must be a 1M, 1 watt resistor. For L2 make 3 turns of 21 SWG enameled copper wire on a 12 mm plastic former. For antenna, use a 1 meter insulated copper wire. The capacitor C3 can be a 50pF trimmer. The BF494 is rated for only 20V. When the phone is hung up, there is more than 48 volts across the BF484, so it will break down. The phone line may not work any more. Thanks for the schematic. Hi, can this circuit will not be detected by the telephone company?, If so, how can we make a solution for it. BTW, T1, T2, T3 is Q1, Q2, and Q3?